During 29 April – 3 September 2017, Ditchling Museum of Art + Craft held an exhibition asking visitors a challenging question: does the knowledge of Gill’s disturbing biography affects our enjoyment and appreciation of his depiction of the human figure? The exhibition was the result of two years of engagement amongst the staff, trustees and colleagues outside the institution in a difficult and at times emotional process of deciding how to present and interpret the work of Eric Gill – an artist central to the museum’s narrative and whose importance to art and design history in the UK and around the world is impossible to ignore, but whose diaries record that he sexually abused his daughters as well as other disturbing sexual acts. Co-curated by Cathie Pilkington, Royal Academician and Professor of Sculpture of the Royal Academy Schools, Eric Gill:The Body featured over 80 works on loan from public and private collections including a major sculpture and drawings that had never been publicly exhibited. This exhibition was just the beginning of the museum’s process of taking a more open and honest position with the visitor and the organization already has legacy plans in place including ensuring there will continue to be public acknowledgement of the abuse within the museum’s display. The museum appointed two writers, Alison MacLeod and Bethan Roberts, to creatively capture and interpret responses to the Eric Gill:The Body exhibition and the difficult themes it addressed. Each writer could decide how they wanted to research their stories and whether to use visitor responses, collected by Front of House staff and responses made on comment cards to questions posed by the museum. The two pieces of work have now been completed: ‘Portrait: Eric Gill Dreaming‘ by Alison MacLeod has been recorded by actress Indira Varma for BBC Radio 4 and will be broadcast on Friday 19 January at 3.45pm. The repeat is at 12.31am on Sunday 21 January. In the meantime, an extract is available to download via the link below, and the full version will be released after broadcast. The full version of ‘Gospels‘ by Bethan Roberts is available to download via the link below. Art can help us to tackle difficult issues in new and engaging ways. The project will provide visitors with a different and potentially more accessible route into the key question of understanding how our knowledge of Gill’s private life affects our understanding and appreciation of his work. The catalogue accompanying the exhibition is also available to purchase via our online shop. Following a huge response to a call for applicants to their Writer in Residence project, we are thrilled to announce that the successful applicants are authors Alison McLeod and Bethan Roberts. Both will provide different approaches to the project, which has been commissioned in response to the museum’s major, thought-provoking exhibition Eric Gill: The Body (28 April – 3 September 2017). The exhibition asks visitors to consider whether their knowledge of Gill’s life impacts on their enjoyment of his depiction of the human figure. The two writers in residence will help to capture, interpret and respond to visitor’s thoughts on this exhibition and the challenging questions it poses. Alison McLeod is a novelist and short story writer. Her most recent novel, Unexploded, was long-listed or the 2013 Man-Booker Prize for Fiction and was serialized on BBC Radio 4’s ‘Book at Bedtime’ and is currently optioned or film. In 2016, she was jointly awarded The Eccles British Library Writer’s Award, has appeared at numerous literary festivals, and has served as a judge on many award panels. 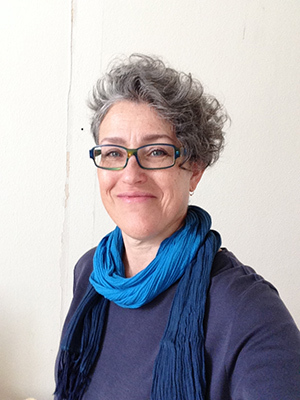 Bethan Roberts specializes in short fiction (winner of the Society of Authors’ Olive Cook Prize and the RA Pin Drop Award), and drama for BBC Radio 4. She has also worked in television documentary and has taught Creative Writing at Chichester University and Goldsmiths College, London. Her latest novel, Mother Island, is the receipient of a Jerwood Fiction Uncovered prize. The results of the project will be revealed in September 2017. During the summer term, pupils at Ditchling (St Margaret’s) Primary School have been busy working on a lettering project with an artist commissioned by Ditchling Museum of Art + Craft. The playful, bright wooden signpost proudly positioned outside the school entrance and the accompanying signs dotted around the school were created by every pupil in a project with museum artist Lauren Baxter. The project celebrates and combines the tradition of signage around Ditchling and the sans-serif typeface (Johnston Sans) designed by Edward Johnston for the London underground in 1916 when he lived in Ditchling. The signs display the school’s Christian values (reverence, forgiveness, compassion, trust, thankfulness, koinonia and perseverance) and its vision statement Learning Together – Building Success. Throughout a series of workshops the pupils explored typography and design in drawing, painting and 3D processes. This project was made possible by a kind and generous donation from Mike and Pam Burr. After three years at the helm of Ditchling Museum of Art + Craft, Nathaniel Hepburn will be leaving at the end of September to take up a new position as Director (Chief Executive) of The Charleston Trust. During his tenure, he has overseen many landmark developments in the museum’s continuing evolution since its 2013 re-launch. Exhibitions including Underground: 100 Years of Edward Johnston’s Lettering for London, The Animals of David Jones and currently Eric Gill: The Body, as well as commissions of contemporary artists such as Cathie Pilkington, Mark Hearld, Bob and Roberta Smith, American artist David Wolske and have seen the museum open up to wider audiences. The innovative The Village of Type featuring the ArtFund crowd-funded the Big Steam Print celebrated the contemporary relevance of Ditchling’s artistic heritage. Earlier this year Nathaniel led a partnership of nine Sussex museums to stage the successful Sussex Modernism exhibition at London’s Two Temple Place. Along with a significant expansion of the museum’s permanent collection, the organisation has received four Arts Council England grants as well as attracting over a £300,000 in grants during this period. It is with mixed emotions that I leave Ditchling Museum of Art + Craft; it is a wonderful time in the development of the museum and I am proud to have contributed to its continuing progress by overseeing this most recent phase. Ditchling was a place of important artistic innovation, and I am delighted that the museum is now full of life, excitement and creation. I would like to thank all of the staff, volunteers, funders, supporters and the museum’s wider community for all their support and friendship over the last three years. We would like to thank Nathaniel for his hard-work, enthusiasm and energy at Ditchling. He leaves the organisation in a stronger place with a committed professional team, a newly developed 10-year strategy and very exciting upcoming programmes soon to be announced. We look forward to working with Nathaniel in his new role at Charleston. Ditchling Museum of Art + Craft will launch recruitment for a new Director in the coming weeks. For our current exhibition Eric Gill: The Body (29 April – 3 September 2017), we commissioned a short film to show visitors in the museum’s Parlour. The film features the exhibition’s co-curators, museum Director Nathaniel Hepburn and artist Cathie Pilkington (whose installation ‘Doll For Petra‘ is also on display in our Wunderkammer), discussing their approach and the reasons for the museum holding the exhibition. The museum is located in Gill’s home village of Ditchling and holds many pieces of Gill’s work in its collection. His depiction of the human form has become complicated by the knowledge of his biography, and the exhibition asks whether our knowledge of Gill’s life impacts on our enjoyment and appreciation of the human figure. To find out more, book now for our ‘Cathie Pilkington in Conversation with Nathaniel Hepburn’ event on 24 August. Hilary Bourne was born in India. She enjoyed a rural childhood at Dumbrell’s preparatory school in Ditchling, and enjoyed the friendship of Edward Johnston’s daughters and family. She wrote: ‘Mr Johnston was like a father to us. He loved children and we loved him’. Her interest in weaving began on a visit to Palestine where she was taught by Russian Orthodox nuns to work with linen and silk. 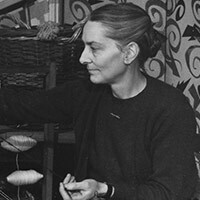 She then sold work by Ethel Mairet, Bernard Leach and Hamada at the Little Gallery in London, and set up a studio and home with the weaver Barbara Allen. During the war she worked with Mairet in Ditchling until restarting the London workshop. While selling through shops, Bourne’s commissions also included curtains for the Royal Festival Hall, fabric for the first jet planes, weaving for early ‘Lurex’, and fabrics for Charlton Heston’s costume in Ben Hur. Her work bridges the hand-made tradition and the technological developments of materials of the time. Bourne returned to Ditchling in later life to care for her mother. She and her sister Joanna founded Ditchling Museum in 1985. Guillaume Francois Brangwyn – known as Frank – was born in Bruges. His father, William, was a talented designer and artist. Brangwyn’s mentors were A H Mackmurdo, William Morris and Siegfried Bing. All instilled in him a strong work ethic and the importance of drawing from nature. Bing also encouraged him to broaden the range of work he designed to include murals, furniture, posters and stained glass. Brangwyn bought The Jointure in Ditchling in 1917 after visiting Sussex to paint the Downs, though he retained a house in London and used the Jointure as a holiday home. After his wife died in 1924 Brangwyn seems to have preferred to live in Ditchling, where he also then established a studio. He produced a huge range of work throughout his life, but is probably best known for the Rockefeller Murals in New York (1930 – 1934) which he created while living in Ditchling, using villagers as models. The subject matter he was given as inspiration was ‘man’s new relationship to society and his fellow men, his family relationships, his relationships as a worker, his relationships as part of a government and his ethical and religious relationships‘. Desmond Chute was born in Bristol. His widowed Roman Catholic mother sent him to Downside School in Somerset, after which he rejected university and chose to attend the Slade Art School in London. On returning to Bristol during World War I he became close friends with fellow ex-Slade student and renowned painter Stanley Spencer. He met Eric Gill in early 1918 when Gill was finishing his Stations of the Cross in Westminster Cathedral. Their friendship developed rapidly and Gill became heavily influenced by Chute’s vision for a creative Catholic community, eventually joining the Third Order of St Dominic of which Chute was a member. He visited Gill’s family in Ditchling and decided to move to the Common and learn to carve stone – Gill designed a house for Chute, Wood Barton, next door to his own family house. His influence was to prove practical in other ways – his mother was financially instrumental in helping to set up the Guild of St Joseph and St Dominic. In 1921 Chute applied to be ordained to be a priest and moved to Switzerland. Ill-health kept him abroad, ending up in Italy where he socialised with writers and intellectuals such as Ezra Pound, Max Beerbohm and W B Yeats. … how much I love you and how much I owe you and how much I learned from you and was and am inspired by you. Joseph Cribb was born and grew up in Hammersmith. His father counted William Morris and Emery Walker as his associates, and it was against this background that Cribb developed his own arts and crafts skills. In 1906 Cribb was apprenticed to Eric Gill at his Hammersmith studio, joining the Gills in their move to Ditchling in 1907. Cribb was a skilled letter cutter and carver in his own right, gaining Gill’s absolute trust and confidence and working with him on many of his major commissions, such as the lettering on Oscar Wilde’s tomb. He also converted to Roman Catholicism with Gill in 1913, following him again into the Third Order of St Dominic in 1920. Cribb’s apprenticeship ended in 1913 and he worked with Gill on the Stations of the Cross in Westminster until he was called away for army service from 1916 – 1919. During the latter part of his service he joined the Directorate of Graves Registration and Enquiries and worked with MacDonald Gill (Eric Gill’s brother) on the design of the standard war grave, returned to Ditchling in 1919 and joined the Guild in 1920. His brother Lawrence (Laurie) also joined the community, and went with Gill to Wales as his assistant – Cribb remained in Ditchling and ran the stonemason’s workshop, taking on his own apprentices. Cribb was a central figure in the Guild, fondly remembered by those who grew up on the Common, not least for his encouragement to visitors to his workshop to try their hand at carving. He is buried in St Margaret’s Church graveyard behind the museum. Philip Hagreen was born in Berkshire. He studied painting in Cornwall under Norman Garstin and Laura and Harold Knight. Like Eric Gill he was a founder member of the Society of Wood Engravers in 1920, though they did not know each other well at that time. Hagreen converted to Catholicism during World War I. He was encouraged to visit Ditchling and settled here in 1923 where he learned letter cutting, temporarily ceasing painting and wood engraving. After a period in Wales with Gill he returned to Ditchling and resumed woodcuts and wood engraving. He also carved in ivory and used this skill when asked, on the works of Dunstan Pruden. He was an important member of the community. The distinct style of his lettering and images appears in many works of the St Dominic’s Press and Guild publications. He was a follower of the Distributist movement that championed individual land ownership in rural communities. In both his work and in his social campaigning he often lightened rather serious subject matter with his sharp wit and humour. As a child Edgar Holloway attended art classes at a college near his home in Doncaster. By the age of 17 he had his first one-man show in London and began selling prints to major collections. He attended the Slade School of Art part-time while earning his living from both etching and portrait commissions. In 1941, influenced by Eric Gill‘s method of living and working, he converted to Roman Catholicism. In 1943 he visited Capel-y-ffin, Gill’s former home, and there met and married Daisy Hawkins (Gill’s former model in the latter stages of his life). When short of work in the post war period he turned his skills to drawing letters for a sign. This became the first of many jobs of lettering and sign writing that he continued throughout his working life. In 1948 he visited Ditchling and settled in the following year. He began to study wood-engraving with Philip Hagreen and by 1951 had joined the Guild. Throughout his life he worked as a designer for publishers and a cartographer as well as continuing to etch and work in watercolour, the village itself and the Guild buildings, providing his subject matter. Edward Johnston was born in Uruguay, the son of Scottish settlers. In his late twenties he gave up medical studies in Edinburgh ‘to go in for a craft’. Living in London in 1898, he was encouraged by W R Lethaby, architect and educator, to begin to study manuscripts held at the British Museum. Lethaby offered Johnston a teaching post at Central School of Arts & Crafts, which he took up in 1899. In 1901 Eric Gill attended his calligraphy class where a strong friendship developed. Both families eventually moved to Hammersmith, an area popular with the Arts & Crafts Movement, where they met the Pepler family. Johnston’s ‘Writing & Illuminating, & Lettering’, was published in 1906, and was to have a major impact on the field of lettering, establishing the modern calligraphy movement which still has an impact on contemporary letter artists. The Johnston family moved to Ditchling in 1912. After a short period living on the Common and running a small holding with the Peplers, they moved back to the village. 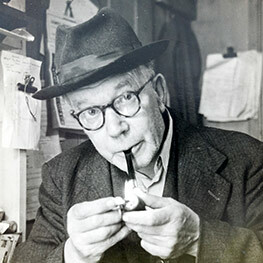 Johnston was to work and live in Ditchling for the rest of his life. David Jones was born in Brockley, Kent. His father, originally from Flintshire, Wales, ensured he was deeply conscious of his heritage. Jones fought on the Somme during World War I and the sights and experiences of the war were to colour much of his life. In 1909 aged 14, he entered Camberwell Art School where he also studied English Literature. Jones served on the Western Front from 1915 – 1918 with the 38th (Welsh) Division. He served longer at the front than any other British war writer, and the toll of the experience was to affect his health for the rest of his life. In 1921 he converted to Roman Catholicism, and visited Eric Gill in Ditchling. In 1922 he moved here to join the workshops and was introduced to wood engraving. He produced many of the illustrations used in the St Dominic’s Press publications, placing image alongside the printed word with great sensitivity. Though engaged to Gill’s second daughter Petra in 1923, they never married. Jones left Ditchling in 1924 and went to London, but then followed Gill to Capel-y-ffin in Wales, living there until Gill’s departure 1928. For a time he joined the 7&5 Society, alongside Ben and Winifred Nicholson and Christopher Wood. In addition to painting and printmaking, Jones wrote extensively. He returned to the subject of war in two major poems: ‘In Parenthesis’ and ‘The Anathemata’. Valentine KilBride was born in Bradford and began work in his family’s industrial dyeworks. After serving in World War I he became interested in the current craft revival, and in particular hand weaving and natural dyeing. Inspired by Ethel Mairet’s book Vegetable Dyes, he applied to be her apprentice and in 1922 joined her workshop in Ditchling. Here he made friends with fellow apprentice, Petra Gill, and was soon visiting the Gill and Pepler families on a regular basis. In 1924 KilBride visited Eric Gill and was invited to join the Guild of St Joseph and St Dominic. This prompted a move to Ditchling Common in 1925 where he set up his own weaving and dyeing workshop. Joined by Bernard Brocklehurst in 1927, the workshop specialised in silk weaving and vestment making, becoming known for the simple beauty of their Gothic-style vestments in contrast to the more elaborate vestments that were in use at that time. KilBride was a key member of the Guild of St Joseph & St Dominic and integral to the development of its ideology, as well as its day-to-day organisation. His daughter, Jenny KilBride became the first female member of the Guild in the 1950s and continues to weave and work with natural dyes in Ditchling. She was also instrumental in developing the museum in the build-up to its re-opening in 2013. Ethel Mairet was born in Devon. Her first marriage to Ananda Coomaraswamy took her to Ceylon (now Sri Lanka) where she became interested in weaving and dyeing. She acquired her first loom in 1909, when she and her husband returned to live alongside the Guild of Handicraft in Chipping Campden. They set up home in Norman Chapel, commissioning Arts and Crafts designer C R Ashbee to convert the building. She married her second husband, Philip Mairet, in 1913 – Mairet had been her first husband’s secretary and had worked with Ashbee. The following year she was visited in 1914 by Mahatma Gandhi, who was familiar with her work in Ceylon and was interested in using simple textile techniques in India. Friendship with Pepler and a favourable impression of the creative community led the Mairets to Ditchling, and in 1916 they made it their home. The same year seminal book ‘A Book on Vegetable Dyes’ was published and still has impact on a contemporary generation of natural dye artists; this impact is celebrated in the museum’s exhibition ‘Dyeing Now: Contemporary Makers Celebrate Ethel Mairet’s Legacy‘. Mairet’s house, workshop and saleroom Gospels was built to her sketches, and her many eminent students and apprentices included Hilary Bourne, Valentine KilBride, Petra Gill, Peter Collingwood and Marianne Straub. In 1938 she was the first woman to be awarded the Royal Designer for Industry. Mairet’s approach to weaving was that it should be sensitive to the texture of the yarns and the design responsive to the colour. George Maxwell came to Ditchling in 1922. He was already a Dominican and was described by many as a serious and thoughtful man. Eric Gill welcomed him as ‘a very great Godsend, a dear good man of beautiful and intelligent humility’. As well as making an important contribution to the community’s ideology, Maxwell brought great practical skills. He built several small houses for the Guild families, and created the Guild’s carpenter’s shop. This provided simple furniture, fittings such as door handles, and everyday objects used by the Guild community. He built his first loom when the weaver’s workshop was established at the Guild. He continued to make them throughout the 1930s and after the War. Maxwell was able to respond to the growing demand for looms caused by both the increase in hand weaving in art schools and workshops in the United Kingdom, and by the difficulty in importing looms from post-War Sweden. He was a keen follower of the Distributist movement and kept livestock and had a small holding to grow food. Harry Douglas Pepler was born in Eastbourne, Sussex, to a Quaker family. He became a social worker for London County Council, and assisted the development of the first school meals service. Can you think of any work I can do in Ditchling? We want an excuse to follow the prophet (you) into the wilderness. He moved to Ditchling in 1913 and immediately set to work as a printer, establishing St Dominic’s Press using a 100-year-old Stanhope Press (now resident in the museum). At the same time he converted to Roman Catholicism and changed his name to Hilary. The Press produced sacred and secular works, using illustrations by Gill, Hagreen, David Jones and Pepler himself. He was a founder member of the Guild but differed with Gill on the approach to it – their friendship suffered a blow after Gill resigned and left for Wales in 1924. Their relationship was never mended, despite Pepler’s son David marrying Gill’s daughter Betty (a marriage which Gill did not favour). After being expelled from the Guild in 1934 he moved the Press from the Common to the village and renamed it Ditchling Press in 1937. Alfred Charles Pruden was brought up in Hammersmith. He took the name Dunstan on his conversion to Roman Catholicism. Attending the Central School of Arts & Crafts, he then worked as an assistant to a goldsmith based in London. Pruden was interested in Eric Gill’s writings and ideas, and following a lecture he gave on Gill, Pruden was contacted by the man himself. On meeting both men realised that they had much in common, and Gill recommended Pruden for his first major commission, an altar cross for Exeter College, Oxford; this commission proved important in establishing Pruden’s reputation. He went on in his career to complete many more commissions for ecclesiastical metalwork alongside jewellery and more domestic items. 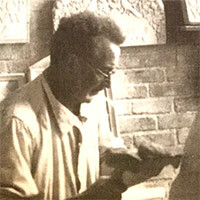 In 1932 Pruden moved to Ditchling and became a member of the Guild. In 1933 his book, ‘Silversmithing’ was published by St Dominic’s Press with illustrations by Philip Hagreen. This helped him secure a teaching post at Brighton Art College where he was to teach for over thirty years. Pruden’s legacy is continued by his grandson, Anton Pruden. Pruden & Smith silversmiths is run by Rebecca Smith and Anton Pruden and continues the Guild’s commitment to traditional craftsmanship and contemporary art and design, working out of their workshop and gallery on Ditchling crossroads which originally housed St Dominic’s Press. Visitors to the museum can pick up a voucher entitling them to a free tour of the workshop. We have been lucky enough to work with talented photographer and film maker Alun Callender, who is making a series of short films about contemporary Ditchling artists and makers. The focus of his most recent film is Ditchling silversmiths Pruden & Smith (Anton Pruden and Rebecca Smith). Visitors to the museum will be familiar with the Pruden name: Anton’s grandfather Dunstan was a member of the Guild of St Joseph & St Dominic’s on Ditchling Common, and you can view his work is on display in the museum. Pruden & Smith proudly continue the Guild’s commitment to traditional craftsmanship and contemporary art and design, working out of their workshop and gallery on Ditchling crossroads which originally housed St Dominic’s Press, and museum visitors can pick up a complimentary voucher to visit the fascinating workshops. ‘John Vernon Lord: A Catalogue For Life’, our Wunderkammer display of Ditchling artist John Vernon Lord’s diaries and notebooks, is proving very popular with our visitors. We were keen to delve a little deeper and find out about his processes and inspirations, so we have made a short film with him in conversation – find out why he thinks looking and listening should be on the national curriculum, and why he is a ‘nerd of the first order’. The world is made up of two different kinds of Christmas gift-givers: those who leave the shopping to the last minute, and those who like to think ahead and put time and effort into making their own special gifts and cards, maybe even make some extra to sell. The prolific artists and makers behind St Dominic’s Press certainly fell into the latter category. With our current exhibition ‘The Book Beautiful: William Morris, Hilary Pepler and the Private Press Story‘ at the forefront of our minds, we take a look through our collection to see how Hilary Pepler’s St Dominic’s Press prepared for the season: commercial Christmas card catalogues, personal gifts, notes and cards to friends and family are abundant, all with their own distinctive style. 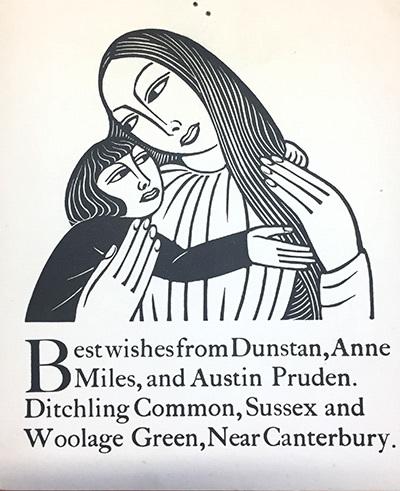 Exquisite engravings, prints and letterpress messages by guild members Eric Gill, David Jones, Philip Hagreen and Hilary Pepler jostle alongside of those other colleagues and fellow artists including Mary Dudley Short and Edward Walters. The card catalogues are particularly interesting – after all, St Dominic’s Press was not just a symbol for an artistic and social philosophy, but also a practical concern with a job to do and Hilary Pepler was keen for the old Stanhope to earn its keep. Posters for local enterprises and even beer labels were amongst its first commissions. It is unclear how and to whom the leaflet was distributed, but it is a fascinating insight into Pepler’s philosophy – a mixture of educative lecturing, social awareness, humour, and an all-important eye on the sales. The preface is a short essay on the contemporary economic crisis, expressing a belief that ‘One cause of unemployment would appear to be in over-production – as anyone acquainted with the modern factory should long ago have foreseen‘. In a knowing and typically humorous footnote Pepler jokes ‘Some people have under-consumed our publications – several St Dominic Press first editions can be bought at published prices, many flats in Tooting are without even copies of ‘Aspidistras‘. The rest of the leaflet is a list of gift suggestions consisting of St Dominic’s Press publications described as being ‘printed on a Handpress and, except where starred, on hand-made paper‘, and categorised under tongue-in-cheek titles such as ‘Presents for Pious Parents‘, ‘For A Lover‘ and ‘For Aunts, Grandparents, School Friends, “Also Rans,” &c‘. The publications range in price from 2s 6d for ‘Three Wise Men. A short play in which Herod takes an important role‘ to the grand price of 30s for ‘Horae B.V.M. (1923), in red and black. Gregorian Chant. Wood engravings by Eric Gill and Desmond Chute‘ (an approximate relative value of £7 and £90 today). In the build-up to Christmas, we will post an image a day on Twitter and Instagram of Christmas-related work straight from St Dominic’s Press … follow us and watch the treats unfold! The Big Steam Print events that took place in the summer may be well and truly over, but here’s your opportunity to buy a piece of print history. Many of our Big Steam Print artists have kindly given us permission to auction the original prints created on one of the five event days via eBay. The first batch of prints is now live (see details below), and will continue to be auctioned in small batches over the coming weeks. All proceeds will go to the museum, meaning we can continue to provide keep providing our programme of fun, free, events. The varying sized linocut and woodcut works were printed on GF Smith 320gsm paper and will be listed for auction at the end of October. With prints from artists including Jonny Hannah, Louise Hayward, Mark Hearld, Anita Klein, Angie Lewin, Linocut Boy, Freddie Robbins, Rob Ryan and Jo Sweeting this is a great opportunity not to be missed. You can arrange to come into the museum during open hours to view the prints by calling us on 01273 844744 to book an appointment, or email enquiries@ditchlingmuseumartcraft.org.uk. You can also download our catalogue below to find out which prints will be going up for sale. Download the Big Steam Print Auction catalogue (7MB). In the meantime, watch out for further details of when the prints will appear for auction. One of the many stories behind our exhibition ‘The Book Beautiful: William Morris, Hilary Pepler and the Private Press Story‘ includes a struggle between pragmatism and obsession. For those uninitiated in the intricacies of design, the idea of becoming obsessed over a typeface may seem alien, but passions ran high in the Arts and Crafts movement and veterans T J Cobden Sanderson and Emery Walker did not come out of their partnership unscathed. Cobden Sanderson was originally a barrister by profession, but his friendship with William Morris led to him becoming a book-binder. In 1893 he set up a bindery in Hammersmith (the crucible for many artistic movements in the late 1800s), naming it after a nearby pub, The Dove. He was passionate in his belief that the beauty of the printed page depended upon the precision and clarity of the layout and an intimate relationship between calligraphy and type; in 1900 he was joined in his Doves Press venture by Emery Walker. Emery Walker was another leading Arts and Crafts figure affiliated with William Morris. When Morris attended a talk given by Walker in the 1870s, he apparently felt as if all his frustrations and ideas regarding contemporary printing had been given a voice – so much so that the spark kindled by their meeting gave rise to the establishment of Morris’ Kelmscott Press in 1891. By 1909 there was no love lost between Walker and Cobden Sanderson and they fell into a bitter dispute resulting in the dissolution of their partnership. Cobden Sanderson continued to run Doves Press until 1916, but never came to terms with the fact that their parting agreement decreed that ownership of the typeface would go to Walker on Cobden Sanderson’s death. With that event coming ever closer, at the age of 76 he resolved not to let that happen and decided to destroy the type by throwing it into the Thames off Hammersmith Bridge. This was no mean feat, especially at his advanced age – it took him 170 trips to dispose of over 1 ton of type. Clearly not a rash decision made in haste. Fast forward 100 years, and the Doves Press type continues its obsessive hold – in 2010 designer Robert Green became fascinated with the story and the typeface at its heart, and not only began a process of digital recreation, but also set out to recover the individual pieces of type from the banks of the Thames – to date he has recovered 150 pieces. Our exhibition charts the connections between these private press luminaries and Hilary Pepler’s Ditchling Press. Hilary Pepler moved to Hammersmith in the early 1900s and met a kindred spirit in another recent arrival, Eric Gill. They struck up friendships with Walker, Cobden Sanderson and William Morris’ daughter, as well as Gill’s old friend Edward Johnston. A couple of decades on, Pepler and Gill were also destined to part ways, although fortunately for us the tools of their trade remained intact – you can view Pepler’s Stanhope Press in the museum, and our exhibition features books and prints from Kelmscott Press, Doves Press and Ditchling Press. If you’d like to find out more about Doves type, watch this fascinating short film with BBC journalist Tom Beal interviewing Robert Green. In a year that has seen the museum go from strength to strength, we were delighted when we recently received the news that we had been awarded a second grant from Arts Council England’s Museum Resilience Fund in support of our plans for growth. Our varied exhibitions programme from our collection and works by amazing, high-profile contemporary artists has received widespread national publicity, along with our first major Public Programme in partnership with Brighton Festival, British Council, University of Brighton and many other partners. This grant will help us access increased funding to continue our ambitious, philanthropic plans for growth, and continue to share our unique narrative with an ever wider audience. At a challenging time for funding in the sector, this fund enables museums to become more sustainable and resilient businesses. This is an important priority in our mission of ‘Great art and culture for everyone’. The focus of our investment approach for museums in 2015-18 is on building a more resilient sector. The Museum Resilience fund is a key part of that, providing vital support to museums right across the country. It is really important that museums are able to diversify their income, capitalising on new opportunities and exploring fundraising prospects. And so we are really pleased to support Ditchling Museum of Art + Craft as it realises its ambitions in this area. So. Farewell then May, and with it the Village of Type programme of events. If you weren’t able to make it to East Sussex last month, we’ve captured the highlights for you here so you can relive our favourite moments with us. The appearance of giant sprayed letters spelling out T Y P E on the walls of quaint village buildings was the first inkling that something was happening in Ditchling, and no-one could have predicted how popular they would become. Typographical wizard Gary Stranger was the culprit, and we even managed to catch him in the act on camera. Visitors have been coming to Ditchling in their droves to have their pictures taken next to the letters, and to capture ‘the full set’. The letters remain on the walls temporarily, so catch them while you can – if you do miss them, you can always check out our short film by Alun Callender. Our open-submission letterpress exhibition proved hugely successful, with over 500 visitors every weekend in May. The exhibition was held in Ditchling artist Frank Brangwyn’s studio ‘The Jointure’, the atmospheric surroundings creating the perfect backdrop against which to display these modern prints. Celebrated printmakers St Jude’s captured the joy of letterpress in ‘Random Spectacular No.5: Interrobang’ a special edition of their specialist print publication, featuring images of the prints, an interview with Alan Kitching, and articles about letterpress and the Guild of St Joseph & St Dominic. Copies can be purchased from the Random Spectacular website. One of the joys of playing host to a resident artist is that the journey they will take during their stay is spontaneous and cannot be predicted, and so it proved with our Typographer in Residence, Polish typographer Viktoriya Grabowska (in association with the British Council and Polish Cultural Embassy). We certainly kept her busy! Home for her during May was Hassocks and her studio was The Blue Shed in Ditchling, where she spent the weekends talking to visitors about her work as part of the Brighton Open Houses festival. She also hosted workshops, visited our sponsors G.F.Smith Papers, hijacked our Instagram account, worked on a new typeface and produced her final project on the Stanhope Press. This final project was revealed at the end of the month and was inspired by the signage and typography she saw travelling around Hassocks, Ditchling and Brighton. No extravaganza can call itself fully launched unless it’s had a party to celebrate, and there ain’t no party like a Ditchling Museum of Art + Craft party (apologies to S Club). The evening sun shone as the party spilled out onto the terrace and people drifted back and forth between the twin venues of The Jointure and the museum. Entertainment included Stephen Kenny on the Stanhope Press, linocutting, printing on the Adana press, calligraphy tutelage, delicious pizza, and last but not least, the legendary musician and local Ditchling resident Herbie Flowers playing live at The Jointure. There may have also been a drink or two consumed, including beers from one of our favourites Bedlam Brewery. Passengers on board services between London Victoria and Brighton were treated to a typographical display over the weekend of 7-8 May. Tom and Theo from Sort Letterpress and our Learning & Outreach Manager Lucy Jenner escorted a pimped train trolley and turned it into a smoking hot portable Adana letterpress vehicle. Every Saturday the museum played host to a different print artist whose work was featured in Interrobang. Each artist demonstrated their letterpress printing skills on the 200-year-old Stanhope Press and many fascinated visitors left with a free print. Our team were joined by Pat Randle from Nomad Letterpress and The Print Project in a pop-up letterpress print studio as part of the Brighton Festival … housed in a full size London Underground tube carriage tent by the beach (of course). Braving the initial high winds and stormy weather, the sun eventually made an appearance over the weekend and much letterpress fun was had by all. The first Saturday the enormous piece of lino was rolled out in the Learning Space, it was greeted with nervousness … visitors were reluctant to dig into such a pristine piece of canvas! After some encouragement the first brave souls had a go and after that we couldn’t keep budding artists away. The lino is now full and the results will be printed by the 12.5-tonne vintage steamroller as the final episode of The Big Steam print on 18 June. The magic of printing is usually hidden in the sheds, workshops and studios of printers and designers. The Big Steam Print brings the secret into the open air for everyone to witness as artists and students from across the country come together for the opportunity to print on a giant scale with our vintage steam roller. Join the excitement as the steamroller makes its final outing on Saturday 18 June at the Ditchling Village Fair, with renowned artists including Angie Lewin, Rob Ryan and Anthony Burrill producing their biggest ever prints in a heady haze of steam and printing ink. The action takes place in Church Lane behind the museum between 10am – 6pm, during which time the museum will be open to visitors as usual (10.30am – 5pm) and will offer half price admission. Ditchling High Street will be closed between 8am – 2pm, and we are advising visitors to arrive via public transport. The Big Steam Print came about through a crowdfunding project via Art Happens. Three previous successful events at Amberley Museum & Heritage Centre, the London Transport Museum Acton Depot and The Level in Brighton, have seen other print luminaries such as Mark Hearld and Jonny Hannah creating giant works of art. Prints from all events which survive the pummelling of tons of steel on tarmac will form the Big Steam Print exhibition at Phoenix Gallery in Brighton: 6– 21 August. Over two days in late April, giant letters started appearing around the village of Ditchling. It turns out that typographical wizard Gary Stranger was the culprit, specially commissioned by the Ditchling Museum of Art + Craft for the museum’s The Village of Type programme of events, running throughout May. Luckily photographer and film maker Alun Callender was there to catch him in the act and record his artistic progress. The events celebrate the centenary of one of Ditchling’s most widely-known contributions to typography – Edward Johnston’s world famous typeface for the London Underground. The letters are written using the Johnston Sans typeface. Southern Rail train passengers travelling from London Victoria to Brighton over the first weekend in May are being offered a unique opportunity to enjoy some onboard entertainment, courtesy of a letterpress on wheels. Theo Wang and Tom Boulton are a dapper pair of designers who make up The Society Of Revisionist Typographers (SORT), a design studio dedicated to creating beautiful modern type design with a wholehearted commitment to the craft of Letterpress. As the 10.20am train leaves London Victoria for Brighton on Saturday 7 May, Theo and Tom will be patrolling the carriages with an on-board printing press trolley, presenting passengers with specially designed letterpress prints to take away for free. The event continues on services throughout the day and will be repeated on Sunday 8. This flamboyant act of typographic theatre offers a great way for passengers to start their journey to the Brighton Festival (taking place 7 – 29 May), and a must-see for any type and letterpress enthusiasts. Letterpress on Board is just one of many events taking place throughout May as part of the Ditchling Museum of Art + Craft’s wider ‘Village of Type’ programme. The Village of Type events include The Big Steam Print (involving a 12.5-tonne vintage steamroller and contributions from well-known artists), Interrobang (an international showcase of letterpress which is shown as part of the Artists Open Houses festival), and a month-long international artist residency with Viktoriya Grabowska in association with the British Council. The events celebrate the centenary of one of Ditchling’s most widely-known contributions to typography – Edward Johnston’s world famous typeface for the London Underground. We are offering London visitors a chance to see rare original drafts of the Underground and Gill Sans typefaces in its exhibition ‘Underground: 100 Years of Edward Johnston’s Lettering for London’ (12 March – 11 September 2016). Over the weekend of 23-24 April 2016, print artists created their biggest prints yet at the London Transport Museum’s depot in Acton using a 12.5-tonne steamroller. They’ll be doing it all again on 22 May at The Level in Brighton, and on 18 June at Ditchling Village Fair. The Big Steam Print was organised by the Ditchling Museum of Art + Craft as part of The Village of Type, a programme of events to celebrate the centenary of Edward Johnston’s typeface for London Underground. How important is your environment when creating your work? My environment is vital as my work is inspired by plant forms in their native landscape. I walk each day, often making sketches and taking photographs for reference. I’ll also collect natural elements to use as inspiration in the studio. There are a number of locations that I visit repeatedly over the years, making the same, familiar walks. The west coast of Scotland, Speyside in the north east and the north Norfolk coast continue to be the most important landscapes for me in terms of their influence on my work. Do the seasons influence your work and mood when creating new pieces? Yes. I’m very drawn to late summer and autumn when flowering plants have ‘gone over’ and their skeletal structure is becoming evident. I also love the bleakness of bare stems and branches and vibrant berries against the windswept winter landscape. In spring I’m inspired by fresh shoots and the starry white of wild garlic flowers. The lushness of summer foliage is less of an inspiration as the plant structures are less defined. The work of Ravilious and Bawden both as artists and as designers as I also enjoy having these two strands to my work – my limited-edition prints, watercolours and collages which I exhibit alongside my design work for [fabric and wallpaper company] St Jude’s and other commissions for products and book illustration. I also look at the work of a wide range of printmakers including Piper, Sutherland, Gertrude Hermes, Enid Marx and Barnett Freedman. My favourite piece pretty much changes from day to day. I think, at the moment, my linocut Sollas Sands is important to me as it depicts where the machair vegetation meets the vast expanse of white sand of the beach at Sollas on North Uist. I visited this beautiful island for the first time last year and am returning this summer to spend more time working there. This print has a different quality as I tried to capture the unique quality of this place. Other than a steam roller, what is the strangest printing method you’ve tried? Hmm, I think I’m a bit traditional. A wooden spoon which I inherited from my mother was used to burnish my engravings and linocuts for many years before I could invest in a press. I still use a combination of the press and spoon as I like the quality that results. Are you looking forward to working to a large scale for the Big Steam Print? Very much. I already enjoy exploiting the contrast in scale between my wood engravings and a screen prints, though creating a linocut on such a large scale will be a real challenge. Do you know what design you will be printing yet? I have an image in mind, but I’m not quite ready to divulge. You use a variety of printmaking techniques, from linocuts to litho. Do you have a favourite? I develop my prints from my sketchbook and each drawing seems to suit a certain print process. This means that I don’t have a true favourite. Ironically, considering I’m about to make my biggest linocut print ever, I am currently very interested in wood engraving. Describe the last piece of art you bought, what was it and who was it by? A watercolour by Emily Sutton of a gondola boatyard in Venice. We had a sneak preview of this while Emily was working on it and couldn’t resist the finished work. It captures the location so spontaneously and acts as a reminder the time we spent in the city. Looking for things to do over Easter? Look no further, we have a few things up our sleeve to tempt you along. We’ll be open every day over the Easter bank holiday, so why not use this as a good opportunity to check out our Underground: 100 Years of Edward Johnston’s Lettering for London? We also have a wonderful mini-retrospective display by London artist Bob & Roberta Smith, and Signs of Ditchling: a tradition of lettering from 1800 to the present day in our main gallery. Should should the weather decide to behave itself, we have a variety of delicious locally-made Downsview ice cream on sale in our Café. Our programme of fun workshops for children continues over Easter: choose from two Printed Patterned Easter Animal workshops on 31 March (for ages 7+), in which children aged 7+ will be encouraged to get their creative juices flowing to print vibrant animal patterns. Then we have two ‘Weave on the Wild Side’ workshops on 6 April in which children aged 5+ will using fabrics to create a superb wildlife picture. You can find more details on our Workshops page, including booking details. Graphic designer Anthony Burrill created a letterpress print for our campaign inspired by our founders’ motto that ‘the most important things to learn in order to survive are how to grow things, how to make things and how to cook.’ We talked to Anthony about his work. The founders of Ditchling Museum of Arts + Craft, Joanna and Hilary Bourne, were born in India and first came to Ditchling as children. Their mother made a home for them here; they both grew up in Ditchling’s creative environment. Hilary Bourne learnt to weave in Palestine and became an accomplished weaver. Joanna Bourne read French at Oxford University and both sisters later taught at North End House School, which they had both attended as children. What themes have you been exploring in your recent work? My text posters produced in letterpress are part of a bigger manifesto; they are provocations to both challenge and amuse. Personally I am most engaged by work that invites me to look a little deeper, to find out new things and challenge me to explore new ideas. That’s what I have always tried to do with my own work. I’ve recently been writing a list of sources of inspiration. So far the list includes my rubber stamp collection, the days of dial-up internet, all the enthusiastic people I have ever met, road signs from different countries and defunct technology. The list grows every day as I look for new ways to be inspired. Do you draw inspiration from other artists and designers? If so, who? Long ago when I was an art student I was fascinated by Pop Art; in particular David Hockney, Peter Blake, Eduardo Paolozzi and Richard Hamilton, all of whom had a graphic sensibility to their work that I was drawn to. I look outside the world of art and design for inspiration now – I’m inspired by everyday things and situations. How involved are you in the printing process itself? I work in letterpress at Adams of Rye and screen-print at Harvey Lloyd in Wadhurst. I’ve had long working relationships with both places and understand the processes involved in making a print. I think it’s important for an artist or designer to fully understand the process they are working with, that way you can explore and experiment. How important is humour in your work? Using humour is a great way of communicating with people, it breaks down barriers and connects instantly. I play with words and their meanings in my work; my aim is to engage with people and produce a spark in their minds. I like work that is witty rather than jokey – one-liners wear off very quickly. I prefer work that has a few layers of meaning. What enticed you to take part in the Big Steam Print? I love the theatrical craziness of it. It’s one thing having a mad idea, but it’s something else entirely to carry it out in such a spectacular fashion. The idea of using a huge steam engine to produce a print is hugely exciting. It draws attention to the letterpress printing process in a novel and hugely memorable way. Also, I’ve always wanted to stand on the foot plate of a moving steam engine! I like all the colours, especially the bright ones. Why do you think people should support the Big Steam Print? It would be a poorer world if we didn’t support such outlandish enterprises. Do you know what you’ll be printing with the steam roller yet? Not yet, but I do know that it will be the largest print I’ve ever made. I’m going to think very carefully about what I’m going to say! Have you ever been on a steam roller before? Or used one to print your work?! No and I don’t think many other people have either! The museum has commissioned Anthony Burrill to design a special poster, inspired by a quote from the museum’s founders Hilary and Joanna Bourne. Printed at Adams of Rye, the poster is now available to buy from our online shop in three colours. Letterpress is a form of relief printing that originated in the 15th century and was the primary form of printing and communication for more than 500 years. In the west, Johannes Gutenberg is credited with inventing the first printing press in the mid-1400s. His hand press was used to print 180 copies of the Bible, 48 of which remain intact today. John Bushell introduced letterpress printing to Canada in 1752, in the newspaper format. He started the Halifax Gazette which became Canada’s first newspaper. Iron presses were introduced in 1800 and could print a larger area with less effort than the wooden presses they replaced. The origin of the phrase “Mind your Ps and Qs” was advice printers gave to their apprentices so they didn’t mix up their backwards-facing lowercase ps and qs while constructing their type. Printers organised capital letters in a separate case above the small letters; this practice led to the terms uppercase and lowercase. Due to uneven cooling, large type could not be cast from metal and was cut from wood instead. Cutting wood type was a slow and mechanised process in the 1820s. Metal type is formed from an alloy of metal, tin and antimony, and cast from matrices in a mould. Pea designed the Big Steam Print linocut, which you will receive when you donate £100 (plus a tote bag). Plus, she’s the one who came up with the whole steam-printing idea. Read our interview! How did you get involved with Ditchling Museum of Art + Craft? I taught a letterpress workshop at the museum and let it slip to Lucy, the learning and outreach manager, that my dream was to make huge linocuts and print them with a steamroller. The next thing I knew, it was happening! Are you excited about printing using a steamroller? Oh yes, I get to wear dungarees and blow the whistle. Did you enjoy your day of filming for the campaign at Amberley Museum? Loved it, especially the bit where we ate custard doughnuts and the film crew told us about their former career making zombie movies. How much of a challenge is it to produce linocuts that can handle the weight and pressure of 12.5 tonnes of steel? I fretted for quite a while about the weight of the steamroller and how it might destroy everything we put in its path; to keep the weight factor down to the barest minimum I took an unprecedented decision: not to eat my doughnut until after we had driven over the linocut. That thing they say about suffering for your art? It’s all true. As it turned out, it printed beautifully using perfectly ordinary, run of the mill lino. 1) My blood-sugar levels when we go on tour. As a printer you must feel a great sense of achievement when your finished work is revealed. What are the benefits of creating work on this scale? I do – there’s a rather large wow factor when you peel the paper back. The scale makes it super accessible; a great spectator sport. And I get to drive a steamroller! What will be the visual theme behind your designs for the Big Steam Print? It’s top secret. I’ve entrusted my dog Ernie with the full-size drawings. They’re locked in the safety deposit box where he keeps his Billy Joel cassette tapes. Don’t bother to check his pockets for the key, he swallowed it. How do you hope to inspire others through this project? By example: girl-power dreams do come true, getting involved in art projects is a delicious thing and art is for everyone. My biggest hope is that Billy Joel fans and doughnuteers all over the south-east will be inspired to surpass their/my wildest dreams. Finally, are you nervous about printing live in front of a crowd? Of course. Have you read the statistics on chaffing injuries sustained by live performers sporting dungarees? I was at that gig in 1988 when Siobhan Fahey had to retire from Bananarama – saw the whole thing from the front row. The engine (No.7886) was built in 1926 by Wallis and Steevens of Basingstoke and sold to Portsmouth admiralty. It stayed there until 1950 before it was sold to a plant contractor for rolling the track down into a sandpit in Rogate. How long have you owned the steamroller? I purchased it in 2010. It was sitting in the sandpit in pieces since the 1960s. Why do you like steamrollers? I am interested in anything mechanical and how it works. A steam engine is just a fantastic display of mechanics in motion. How long did it take you to restore it? I rebuilt it over a year. How many litres of water does it use up in a day? It will use about 80 gallons of water to do 10 miles. How many bags of coal does it use a day? It will use about 1 tonne of coal to do 60 miles. Nope, I haven’t intentionally ran over something. What is the fastest speed it goes? It will average about 5mph. You said that you sometimes cook roast dinners – how does that work? You can cook all sorts in the smoke box like a normal oven (before the heat goes up and out of the chimney). Yes. Two – forwards and reverse. Do you own any other vintage machines? I have quite a few other vintage machines. I have a Marshall traction engine that I am restoring at the moment, a 1957 Latil timber tractor and a a 1940s Aec matador.